When putting up new fascias, soffits and bargeboards or replacing them, one option is to fit UPVC. Usually available in white, UPVC fascia and soffit material will save maintenance and looks great - there will be no need for repainting every other year, just wiping down with a damp cloth should bring it back. On some houses, the existing fascia will include fixings for the telephone and/or mains electricity, these services will need relocating onto any new UPVC fascia you fit, this relocation MUST to undertaken by the appropriate service supplier, so speak with them before you start. Although not cover by this page, the roof guttering will need to be removed before the fascia can be replaced. Remember that replacing fascia, soffit or bargeboard necessitates working at height and due care is necessary. It is not a job for a person on a ladder. Appropriate scaffolding is highly recommended. When replacing a wooden fascia, soffit or bargeboard, it is recommended that the old fascia, soffit or bargeboards are all removed. Some 'professionals' will clad over existing wood but this risks trapping moisture which could cause serious rot in the structure. Cover Board is, as the name suggests, for covering existing fascia, whereas Fascia Board is intended for use without a backing surface. While Cover Board tends to be thinner as it is not acting alone as part of the structure, the main difference is that Fascia Board has a recess along the inner corner to locate the Soffit whereas the inner corner of Cover Board is a plain right-angle. Current building regulations require ventilation in the soffit for new buildings (equivalent to a one inch gap along the whole perimeter), although not absolutely necessary, when fitting replacement soffit, it is worth considering fitting ventilated soffit to improve ventilation of the roof void. If you need to replace wooden fascia, this probably indicates that the building is 20 years or more old and, where fitted, the roofing felt under the tiles should be checked at the eaves. Felt often deteriorates at this point and, if necessary, it should be replaced up to the first batten (or, as a minimum, 12 inches (300 mm)). When fitting new felt, ensure that it projects about 3 inches (75 mm) over the fascia and is fitted under the existing felt so that any water runoff runs onto the new felt rather than under it. Allow 5 mm clearance at each end of the material to allow for expansion. Fit a cover strip at each joint and corner. 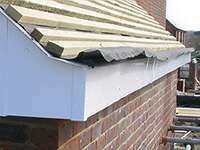 Before starting to fix a length of fascia or cover board, clear a whole side of the building of guttering etc. and fix a horizontal builders string line along the side of the building so that all sections of board can be levelled to the same line. 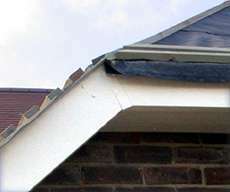 The figure to the right shows an existing wooden fascia clad with UPVC, if you decide to use this method, it is best to remove the existing soffit. As most existing soffits fit into a slot on the inside of the fascia, it is possible to release the soffit by cutting off the bottom of the fascia. The new fascia should be pushed up under the ends of the tiles and levelled before fixing, it's easier to get the fascia straight if the lowest row of tiles can be pushed up out of the way while the fascia is positioned and fixed. Fix the fascia using plastic headed stainless steel ring nails (specifically supplied for the job), two vertically at 600 mm horizontal centres. Position the nails vertically so that they spread the load, one near the top of the surface behind, one near the bottom. Keep the vertical position of the nails constant between horizontal positions otherwise the line of nails will look a mess. Into a upvc channel fixed to the wall of the house. Screwed to a wooden batten fixed above the soffit to the wall of the house. To the top of the outer brickwork using either a batten down from the rafters or a structural glue between the soffit and the top of the wall. As mentioned above, to do the job properly, the original timber fascia, soffit and bargeboard should be removed before fitting replacements. Any rot in the ends of the rafter should be repaired using good quality timber treated with preservative. Make sure that any old nails in the ends of the rafters are removed (or knocked in below the surface). 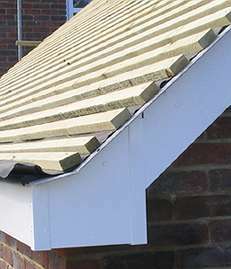 The eaves felt should be checked and repaired. Fix the fascia to the ends of the rafters using plastic headed stainless steel ring nails, with the first set of tiles pushed up, locating the ends of the rafters is easier. Cladding Bargeboards with UPVC is similar to cladding fascias, the main difference is that some cutting of sheet UPVC will be necessary to shape around the eaves end.